eBay In time for the release of Spider-Man: Homecoming, Funko has transformed the Marvel characters into Pop! Vinyl figures. 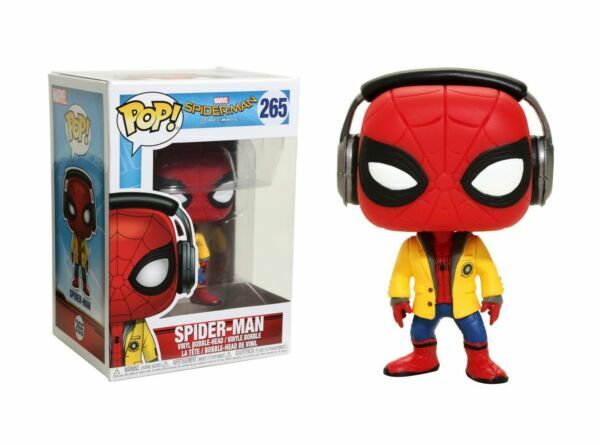 This vinyl bobble-head features Spider-Man complete with his yellow school jacket and headphones. Spider-Man stands approximately 3 ¾ inches tall and is packaged inside a window display box. Bring home the complete Spider-Man Homecoming series with; Peter Parker, Spider-Man, Spider-Man Homemade Suit, Tony Stark, and Vulture. Recommended Minimum Age: 3 years - small parts not for children under 3 years. Shop Our Story Contact Us Funko Pop Marvel Spider-Man Homecoming: Spider-Man Vinyl Bobble-Head #21660 Click to enlarge Item Details Character | Pop! Marvel: Spider-Man Homecoming - Spider-Man Material: vinyl Spider-Man vinyl bobble-head stands approximately 3 ¾ inches tall and is packaged inside a window display box. Recommended Minimum Age: 3 years Made in Vietnam Product Description In time for the release of Spider-Man: Homecoming, Funko has transformed the Marvel characters into Pop! Vinyl figures. This vinyl bobble-head features Spider-Man complete with his yellow school jacket and headphones. Spider-Man stands approximately 3 ¾ inches tall and is packaged inside a window display box. Bring home the complete Spider-Man Homecoming series with; Peter Parker, Spider-Man, Spider-Man Homemade Suit, Tony Stark, and Vulture. Recommended Minimum Age: 3 years - small parts not for children under 3 years. Payment Policy We accept PayPal for all eBay orders WA sales tax of 7% will be added to all orders shipping to Washington International Buyers – Please Note: International shipments can take up to 6 weeks to arrive. Import duties, taxes, and charges are not included in the item price or shipping cost. These charges are the buyer's responsibility. Please check with your country's customs office to determine what these additional costs will be prior to buying. We do not mark items as under value or as gifts.